is the first time we see it. Improv is live theatre without a script. Following sold-out success in 2016, the Singapore Improv Festival is back - and this time, we're bringing international friends. Featuring performances by no less than 40 teams, this year's festival showcases teams from Singapore, the Philippines, Hong Kong, China, South Korea and Germany. Expect the best of the comedy and alternative theatre scene. Laugh with us. Cry. Come watch. We've got improv workshops for beginners and improvisers/performers/actors. 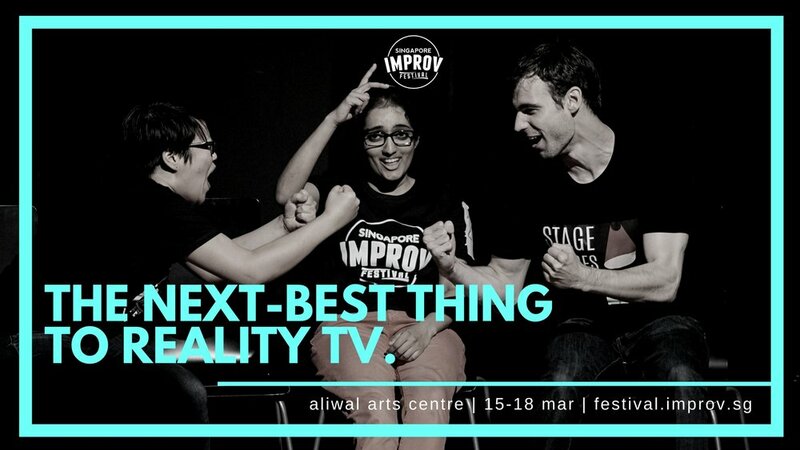 Find out which team performing at the Singapore Improv Festival should you audition for. The Latecomers are the latest international improvisational comedy troupe to be based in Singapore. They'll be at Singapore Improv Festival! One of the teams performing at Saturday Night Laughs. PICARD brings you high-energy, belly bursting laughs. We've got improv workshops for beginners and for improvisers. Wait what? Don't say bojio. Meet some of our the performing teams at this very special show that's all about the narrative. Founded in 2013, TIC is Singapore’s biggest and only improvised theatre company. We delight in teaching improv and performing bi-monthly shows in our studio at South Bridge Road. Consistently delivering fun, accessible and high-octane theatre, we have performed internationally at festivals in Manila, Shanghai and Canberra. Locally, we've performed at the Singapore Night Festival and the Arts House Open House. The Improv Company also regularly conducts corporate coaching and tailored workshops on the finer points of creative collaboration. From tech giants and MNCs to local blue-chips, past clients include Facebook, Grab, NBC-Universal, Grand Hyatt Singapore, Temasek Holdings, BNP Paribas, Singtel, MOE and the Singapore Prison Service. Find out more about its corporate involvement on The Improv Company homepage. We were on TV to promote the Singapore Improv Festival! Hazel had to improvise on live TV. 'Making things up on the spot for an adrenalin rush' - you can still find a digital copy online! 'Improving on improv' - you can also find this information on their digital archive! The Improv Company mentioned in the Straits Times alongside The Latecomers, who will also be performing in the Singapore Improv Festival this year! We performed to a sold-out show in the Singapore Night Festival last year and will be back for more!